As I sit here contemplating what I have discerned during my brief time away from this blog, I would say it is this.... That I have realized just how important it is to never lose my focus on loving people and God. As I reread those words, I know they sound overused and appear to lack originality or a fresh perspective, but let me elaborate. For the last four years I have dedicated each day to being alert and aware of what is happening on the world stage, because like all of you, I see what a scary place it is becoming. I have felt a calling to try to bring both clarity to what I see, and a reassurance that God is still Sovereign and in control. I have tried to look at events and situations through a Biblical lens to try to understand the implications for our spiritual lives and how we are to glorify our Lord. But for the last 5 or 6 days, I have intentionally shifted my focus away from the world and centered it on individual people. I refused to let the mounting tensions of terrorism, racial division, government corruption, or any of the other news stories that permeate our everyday existence interfere with connecting with the people in my life. I was aware that all the disorder and mayhem was still swirling out in the world, and could not escape references to Russia, Syria, Planned Parenthood, gun control, and tension in Chicago, but I refused to let it permeate my sphere. In effect, I took a mental and emotional break, and I found that concentrating on Jesus's two great foundational commandments -- loving the Lord my God with all my heart, and with all my soul, and with all my mind; and loving others before myself -- transported my soul to a place that transcended all the world chaos. And what peace and rest I found! Instead of having one eye on family and one on world events, I was able to immerse myself into deeper engagements with people -- not news headlines, not current events blogs, and not the actions of those who would destroy my country or way of life. It was a time of real connection with neighbors, individual family members, and my husband. And it was all independent of how the world was effecting us. It was deep conversations about goals; it was sharing intimate moments and memories; it was engaging in activities for the sheer fun of it, and most importantly it was about exploring our God and discovering new insights for both old Believers and new Christians. I think I was experiencing real thankfulness and the true human experience. And in the midst of it, I received such blessings and saw God at work! I watched Him work through the people we chose to surround ourselves with; both those related by flesh and blood and those linked through the blood of Jesus. Friends who are going through some changes in their personal life were invited to join in our Thanksgiving celebration, as were friends who have become like family. And the greatest blessing of all for me was the presence of my cousin's son, who spent the entire weekend with us. I have just recently "found" him, so to speak. His mother and I were part of a close family growing up. We both grew up in Illinois and then I went off to college in Texas. The last time I saw her was at my wedding nearly 29 years ago, and before she moved to California after her own college graduation. Needless to say, life then got in the way, and our paths just never seemed to cross. Then out of the blue, she calls me in September and says her son is going to school here in Texas on a football scholarship. Naturally, I was more than excited to reconnect with her and get to know her son. When I saw her walk through that door, it was like all the years melted away, and I have since been so sad at all the wasted time. Her son said he was glad to know he had family in Texas and it was a foregone conclusion that he would spend his Thanksgiving break with us. Needless to say, I know that God does things in His own timing, and I am now convinced that our reunion was a Divine Appointment! My husband and I spent the weekend getting to really know him; laughing together; relating family history; and best of all, many long conversations about our shared faith. I have been given so much hope that God is still at work in our youth and our nation. His inquisitive mind is asking all the right questions about God and about the purpose for his life in these times; about the bigger concepts of God that he has not heard in the Church; his knowledge that God is a God of not only Love, Grace, and Mercy, but of Justice and Judgment; and yes, even questions about the relationship of the fallen angels, the Nephilim, and the space aliens that his generation is so interested in. At 21, he is light years beyond what my understanding was at that age and wants more knowledge about the God Most High. He is an exceptional young man and I'm looking forward to having him in our lives. 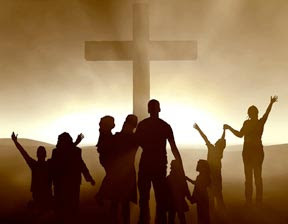 So, as I reflect back over the weekend and my "time off", I am not only grateful for the rest and respite, but so thankful for the opportunity God gave my spirit to revel in the renewed connections with my family and friends. And I want to extend that concept of family, because it not only included those in my physical presence, but those of you who take the time to connect with me through this blog. Because you are family, too. I really know what the term "the family of man" means now, and I am so appreciative to God for allowing me to see where my priorities lie. I needed these few days off. I am refreshed and revived and full of hope. Yes, I will continue to engage in our conversations about what is going on in the world... in effect, we need to because, after all, we cannot ignore the plans, lies and deceit perpetrated by the Enemy. But I have a greater sense of our purpose, and how we are to live our lives to glorify our God. I hope to maintain this new sense of optimism, even as I know I must immerse myself back into dissecting the world and its ramifications for God's kingdom. I will continue to look at the ugliness with which Satan is infusing the world, and I will persist in revealing how I think God wants us to take our stand. But, at this very moment, I am at peace in my spirit and I know this is where Jesus wants me. So, we will move forward together, knowing that the presence of God is ever before us. We will be grateful for each day He gives us, showing His love toward others and appreciating the Divine favor He shows us. The giving of thanks .... that is what it was all about, and I don't want to ever lose sight of that. Psalm 26:3 "For Your steadfast love is before my eyes, and I walk in Your faithfulness."